Cherry Tree Cottage bordering RSPB Arne Nature Reserve, ideal for walking. Cherry Tree Cottage is an idyllic terraced cottage in the quiet village of Ridge which is located on the South bank of the River Frome. 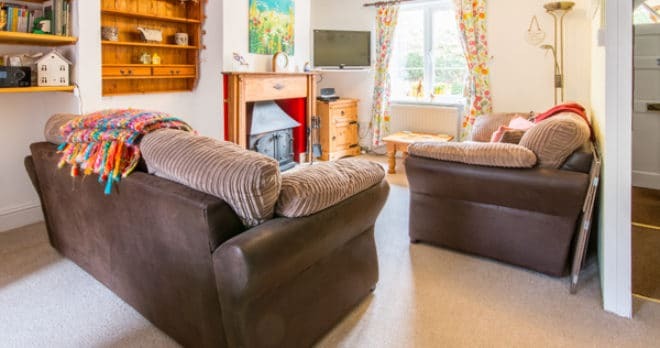 This delightful cottage is equipped with all you might need for a family get away in peaceful surroundings, yet is still within easy reach of a wide range of attractions and sandy beaches. If you are seeking a romantic break, a hand in hand stroll along the river bank to the market town of Wareham is a must. Here you will find a range of eateries, bars and a quayside ice cream parlour. Why not hire a boat to venture further along the River before returning to a roaring log fire. The accommodation consists of a comfortable and cosy living room/diner with feature wood burner. 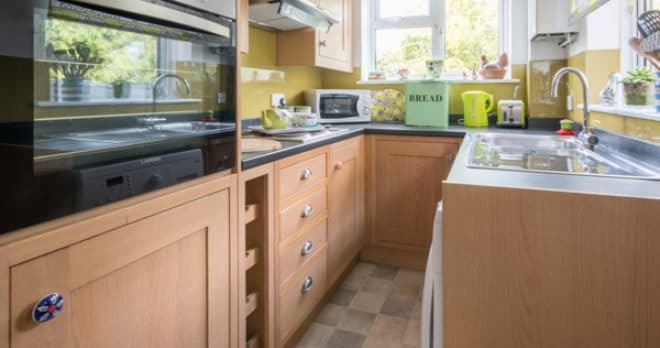 A small well planned galley style kitchen which is compact yet well-equipped, door leading to patio area and garden with furniture. 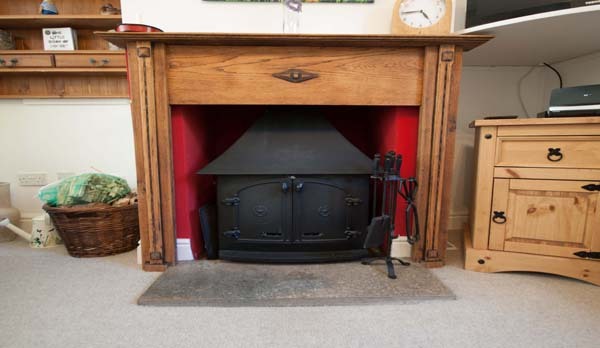 On the first floor you will find a welcoming master bedroom complete with ornate fire place. 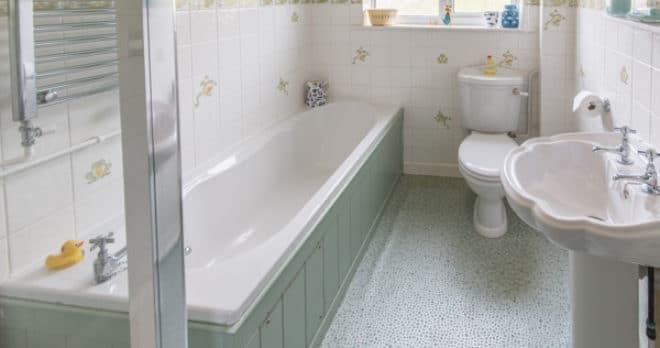 A further twin bedded room and large family bathroom with double shower and bath. The village of Corfe Castle is just a short drive away through Hartland Moor where you can explore the famous ruins and model village. A larger selection of eateries are available in the seaside town of Swanage which hosts a range of activities for all the family including award winning sandy beach, museum, gardens, sport facilities, sailing, diving, golf and a range of shops. 2 Bedrooms. F/FL King and F/FL Twin. Lounge/diner, TV, DVD, DAB radio, log burning stove. Dining table to seat 4 for formal dining. Small galley kitchen, double oven, hob, microwave, fridge/freezer, w-machine. F/Fl Family Bathroom with WC, double shower cubicle and bath. Small secure Garden, patio furniture and lawn area. Parking for 1 in allocated space in a small car park to left of Cottage. Central Heating. Travel cot (no linen) and High Chair. Linen included in weekly and short break bookings, towels are not supplied but available to hire separately. One well behaved dog welcome. WIFI. Enjoyable holiday for us both and the dog. Our third very happy holiday in Cherry Tree Cottage. Thank you. This is our second holiday at this cottage,it has everything and more.Area is good for walking, and a short trip to RSPB Arne.We will be back, Thank you to the owners, and to Dorset Holidays for your excellent service. Lovely cottage with everything you need for a comfortable stay. Very warm and cosy. Near to Arne nature reserve where we spent a great day and RSPB walk. Lots of walks from the door and just a 20min stroll down the river into Wareham with little shops/pubs/cafes to cater for all your needs. We hope to return next year. A very nice cottage, well -equipped and extremely family friendly. Ideally located for visiting stunning beaches, castles and many other attractions. Our first booking with Dorset Cottage Holidays proved to be a good choice, from initial booking, receiving final directions and area information, to arriving at a sparkling clean home with welcome pack and wine we felt we were a valued customer especially as we were phoned after arrival and asked if all was well. We are going to be a regular client from now on! Had a wonderful time in great weather, walking coastal paths and round Brownsea and Arne. Also visited Corfe Castle and then walked to Swanage and got the train back. Cottage great. Couple of things. Squeaking bathroom door and could do with a blind in the bedroom as very light from 4am! Otherwise everything we needed. Great location and enjoyed river walk into Wareham. An ideal holiday, for us. We had a very happy, relaxing week. The cottage was warm and comfortable and met our needs. We like the location and the fact that it is dog friendly. 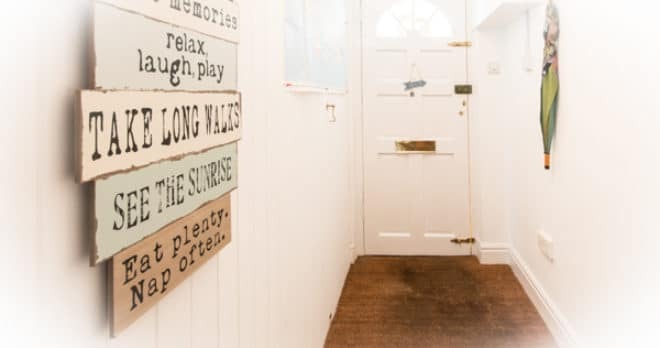 Cherry Tree Cottage is an ideal retreat in a lovely location. The cottage is delightful and has everything you could need for your stay .We loved the garden and the quirky nature of the cottage. Everything was clean, bright and fresh. A lovely area to visit. 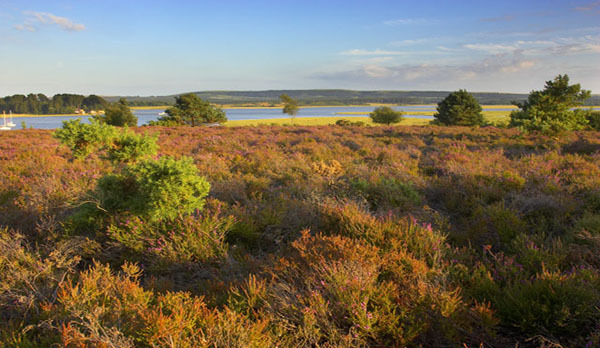 Easy access to Arne RSPB reserve and lots of other interesting locations in easy reach. Lots of good walks all around. A very quirky olde worlde interior, so much to look at. Very clean and tidy,close to rspb Arne.,we are keen birdwatchers.Will be back.Stayed from Feb 7th to the 13th. The Cottage was very welcoming, being very clean, warm and well equipped. The Christmas decorations were lovely and unexpected as were the welcome goodies. It will be perfect when we come back to Purbeck. Great cottage that instantly makes you feel relaxed. Tastefully decorated for Christmas - we made good use of the log burner although the central heating was more than adequate. The kitchen, although compact, was fully equipped. Quiet spot for a restful time. Could have stayed a lot longer - maybe next time! All you would want from a holiday cottage and more !!! A very comfortable cottage, with lovely personal touches - a real home from home. 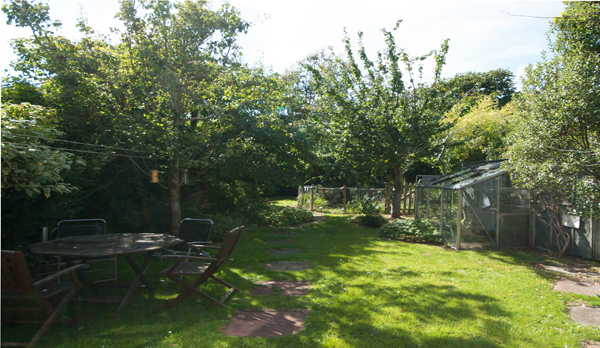 Peaceful location with beautiful walks on the heath from the doorstep and wildlife in abundance. We have been visiting the Isle of Pubeck for many years and Cherry Tree Cottage really tick's all our boxes. We will be back! All very nice,lovely clean cottage, Would go again at different time of year so there were no spiders!! Everything we needed for a fabulous holiday. 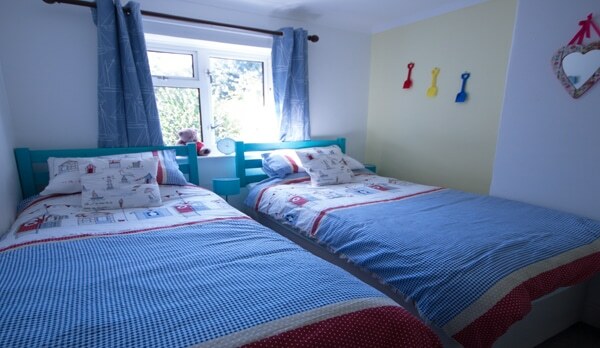 The cottage is small but perfectly formed for our family (2 adults, 2 children aged 8 & 6). It is cosy and homely. Everything we needed was in the cottage and the location was great. A lovely riverside walk into Wareham and we didn't need to travel further than about 15 miles to get to anywhere we wanted to visit....beaches, Tank Museum, Monkey World, Corfe Castle. We will definitely come back to Dorset and would book this cottage again. Lovely cottage very thoughtfully fitted out. Very much enjoyed our week in Cherry Tree Cottage. It was comfortable and very well equipped with lots of thoughtful touches considering potential guests of all ages.. Lovely garden. Good location - we walked into Wareham and it is easy driving distance of the whole of the Isle of Purbeck, Poole, Wimborne etc. Lovely cottage in a peaceful setting with lots of fantastic scenery around and about. We had a brilliant week at Cherry Tree Cottage. The instructions were clear and the cottage itself was welcoming and very well equipped. It's really well situated with lots of interesting places to visit nearby and great walking. we had a wonderful holiday, the cottage was beautiful every thing one could possibly need was there,we would like to say that perhaps a notice should be placed on the front of the stairs not only coming down but also going up!! as my husband did hit his head a lot. but it did not spoil our stay,garden is so peaceful we didn't want to leave. thankyou. Cherry Tree Cottage is a real gem. Tucked away in a rural lane it provided everything for a fabulous visit to Dorset. The cottage is well equipped and of a very high standard. The garden provided a lovely space to observe the birds feeding and we saw deer in the woods opposite, our stay was just perfect. Touches such as the basics welcome pack and the wine were an added bonus, much appreciated after a long journey. We will definitely visit again. We cannot find any negatives about this cottage. It is beautifully maintained, very clean and well equipped. As we had our dog with us we were overjoyed at the variety of walking we could do both from cottage and in the area. I would thoroughly recommend to others and would certainly come back to the area. Cosy, relaxing,yet with all necessary modcons. A most enjoyable weeks holiday for us three humans and Poppydog. Wonderful walks and British wildlife at it's best. Can't really fault cottage, but would suggest larger kitchen waste containers for food and general waste-bin. Bye the way, are residents responsible for putting the carpark bins out in the road?, as our bins were over flowing when we arrived.,but that did not detract from our enjoyment needless to say. We all felt rather sad on leaving Cherry Trees. Response from Owner - We are pleased you had a wonderful stay at Cherry Tree. Thank you for your feedback regarding the refuse, we can confirm we are working to resolve this minor issue and apologies that it was a problem during your stay. We hope to welcome you back again soon! A second wonderful Christmas at Cherry Tree Cottage. We loved the area, the decorations and the cottage itself. We hope to be back sometime in 2017. What a lovely warm welcome you get when you arrive at Cherry Tree. The gifts and supplies made it feel like it's home from home. We didn't feel like we were in someone elses home and enjoyed the surroundings and homely touches. We had many long walks along the coast, Swanage, Durdle Door, Lulworth Cove. We also enjoyed the cute towns of Poole Wimborne. We hope to come back again soon. Lovely 6 days in the beautiful Dorset countryside. Fantastic weather and not a drop of rain. 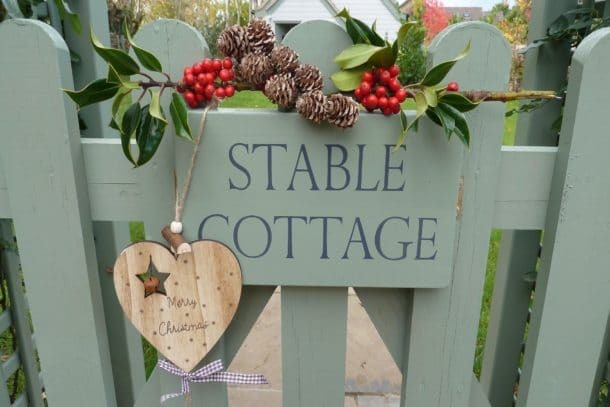 Cherry Tree Cottage is a cosy venue in the quiet hamlet of Ridge. Im sure we will be back. Lovely stay - fabulous for birds! 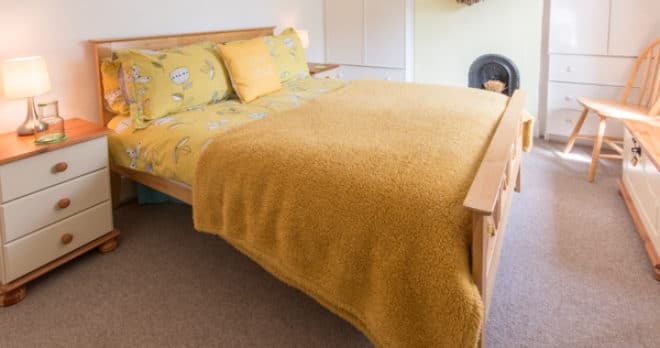 We enjoyed staying at Cherry Tree Cottage - it was a comfy, cosy cottage which met all of our needs, and our little dog enjoyed his stay too. It is a very well equipped cottage, which sleeps 4 comfortably. It was lovely to have access to a private garden too. A short walk through the village and along the river takes you to Wareham where there are a few pubs, shops and a supermarket. Relaxing week away with a 3 year old. Beautiful, homey and warm cottage. 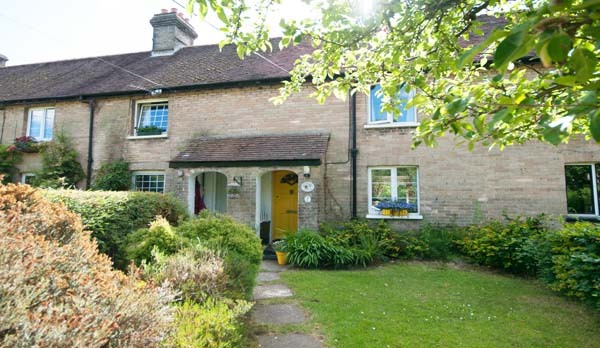 Well situated for all place, Corfe, Weymouth etc. Perfect for a relaxing week away with a 3 year old who loved the steam train, brownsea island, bird watching and of course the beautiful beaches, Will be sure to return. 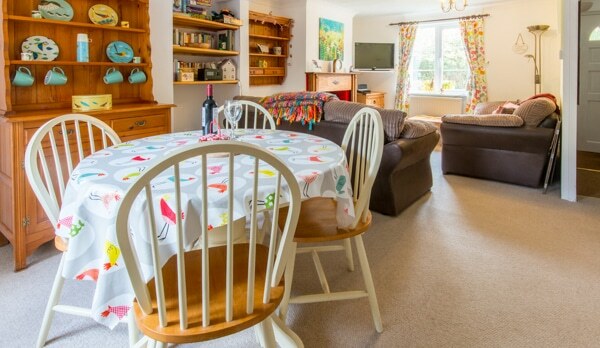 Cherry Tree cottage has everything you need for an enjoyable stay. 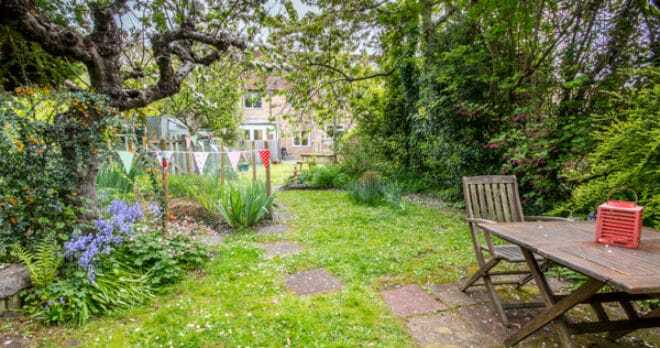 It is in a peaceful location with an attractive and secluded garden. The cottage is comfortable and cosy. It is very well situated. Wareham is a 20 minute walk along the river and Stoborough Heath, with good walking, is on the doorstep. We enjoyed being at the cottage and also being able to visit so many beautiful and interesting places within such a short distance. We will be back! Lovely cosy cottage with everything you could possibly need. Had a lovely long weekend at Cherrry Tree Cottage. Long walks in amazing countryside then back for a cosy night in front of the log burner. This cottage had everything you could possibly need and more. Look forward to returning in the summer to make use of the lovely sunny garden. This is the most thoughtfully equipped self catering cottage we have ever stayed in. Warm, cosy and the perfect place to enjoy a few precious days of Dorset winter sunshine. Thank you for a wonderful stay! We loved the cottage, which is just as well as it rained vigorously for the first half of the week! 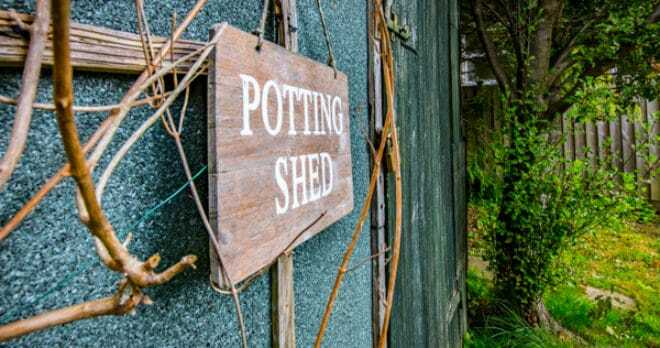 There is so much to do on the doorstep that we could pop out when the rain stopped! We were stunned by the beauty of the countryside- the walk from here into Stoborough heath, Arne RSPB and further afield to Studland beaches and Brownsea Island, which we enjoyed in beautiful sunshine. We've seen red squirrels, common lizards, deer and much much more. Lots of firsts for the children to remember! The cottage has everything you need a proper home from home. Thoroughly enjoyed our stay, look forward to visiting again. Beautifully presented home with so many thoughtful and welcoming touches. We've had a lovely time and will definately come again. Loved the house, love Dorset! Lovely little cottage in a quiet area of Wareham. Has everything you need. Two thirds of garden is fenced off but there is still enough to sit out in and for dogs to run around in. Really enjoyed our stay.